The Red Sox have found themselves back in second place. Even though they still have the most wins in baseball, the Yankees have a better winning percentage. They officially relinquished the division lead after losing 1-0 to the White Sox on Friday. That was a game in which Chris Sale went eight innings and struck out 10. In other words, it was a game where you need to give your star pitcher some run support. But little run support turned out to be the theme of the weekend, and they lost two out of three to Chicago, while scoring a total of six runs. Meanwhile, the Yankees were busy winning nine out of their previous eleven games. The teams the Yankees were beating were by no means the best in the league, but they were still winning games. And it let them take over the division for the first time since May 16. Fortunately for the Red Sox, though, they’re in a good position to at least keep pace with the Yankees with their upcoming 10-game road trip. They start off playing the team with the worst record in baseball: the Orioles. This is an Orioles team that has lost four in a row and eight of their last 10. On top of that, the Red Sox will be trotting out Steven Wright, Eduardo Rodriguez and Chris Sale against them. Wright is coming off his first start of the season in which he went seven scoreless innings against Detroit. To follow, Rodriguez is having a better year than many people realize. The Red Sox are 11-1 in his starts and his ERA has seen a steady decline since the beginning of May. Finally, Chris Sale is Chris Sale. Baltimore is in the bottom third in the league in strikeouts, so that plays right into Sale’s strength. The Sox will then head out to Seattle to take on the Mariners, who lead their division and have been playing well of late. 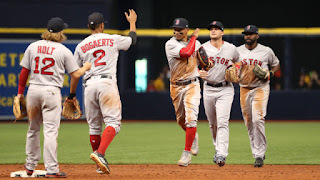 They also are the only team in baseball that has reached the 40 win landmark other than Boston and New York and they have a 20-12 record at home. This series comes as a perfect opportunity for the Red Sox to silence the people who still don’t think they can beat good teams, even after they split the Houston series. They can be confident going into the series because they are 21-11 on the road. They’ve been able to do this on the back of standout pitching – they have a 3.22 ERA and .213 batting average against on the road, both of which are good for third in baseball. So a good showing against Seattle would be a good chance for them to flex their muscles and put more doubt in the naysayers’ minds. The Red Sox’ last stop before seeing the green of Fenway Park again will be in Minnesota to play the Twins. After being in first place in the AL Central for most of April, the Twins have fallen off a bit and now sit in third place, 5.5 games back of first. But this is in a surprisingly subpar division, where the team in first place – the Cleveland Indians – is only five games over .500. For some perspective, the Twins would be 15.5 games out of first if they played in the AL East. If anything, a series like this should serve to help Boston even further separate themselves from the bottom three teams in the East. Meanwhile, over the same time span, the Yankees will be playing 10.5 games in 10 days. They’ll be playing the Nationals, Mariners and Rays. This includes a day where they will pick up a suspended game against the first place Nationals in the sixth inning on the same day they play another full game against Washington. So with the exception of the Rays, the Yankees will be playing some formidable opponents. But fatigue alone could be enough to give them a hard time even in that series. 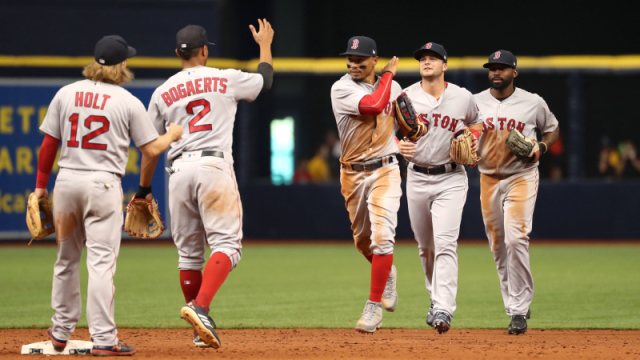 The Red Sox had been playing well prior to the White Sox series. Hopefully that series was just a blip in the radar for them, because the baseball gods have put them in a prime position to retake the division lead from the hated Yankees. The opportunity seems to be there. Let’s hope the Red Sox are ready to seize it.